Designs Unlimited Services has been installing and maintaining custom high-quality hard wood and tile flooring, as well as bathroom surrounds and kitchen backsplashes since 1989. We take pride in our craftmanship and want our clients to be satisfied as well. 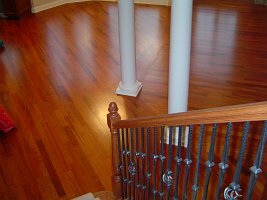 Specializing in wood and tile flooring of all types and for every purpose, Designs Unlimited Services also provides expert wood trim and staircase remodeling and refinishing to complete your project. Our Gallery Page illustrates the high-quality craftmanship our clients have come to expect. After an on-site inspection, each wood and/or tile flooring project is individually quoted with a firm price in order to avoid surprises. The job is never complete until you are 100% satisfied. Call us today at 847-438-9570 or 815-790-9570 and set an appointment for us to visit your home or business and create a beautiful living or working space.